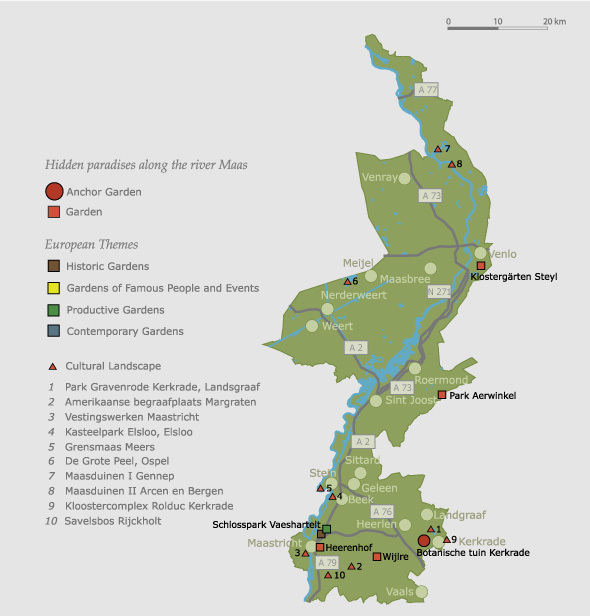 Limburg’s identity has developed in part from the social and cultural history of the Meuse river basin. The typical characteristic of the region is its wealth of manor houses, country estates, monasteries and fortified towns, which nestle in the landscape of the province. These points of interest are connected together by the Meuse, which flows through the whole province and gradually reveals its green secrets to visitors. 140 gardens from the region were available for selection when the Gartenroute Limburg was being compiled. The province decided on a “garden journey through time”, whereby the gardens chosen reflect certain trends which were characteristic of their respective periods. The manor houses and their domains are characteristic of the first period. Parks and gardens were laid out in the direct vicinity of the manor houses, above all in classical form and with stylistic features. The influence of the state mining company “Staatsmijnen” was of major significance in southern Limburg during the second period, as it created numerous gardens and parks in order to improve living conditions in the area. The private gardens sphere began to evolve during the third period. The tending of gardens by private individuals became a major economic sector. An increasing number of plant breeding businesses and garden centres offered a large range of plants, bushes and trees which were now within everybody’s financial reach. These gardens nestle in Limburg’s varied cultural landscapes, most of which developed as a result of cultivation stretching as far back as 7,500 B.C. Gardens and parks are one particularly significant aspect of this cultural history of Limburg. Gartenroute Limburg provides a framework for focusing not only on the historical development of the gardens but also on their stylistic form and vegetation. The Gartenroute thus provides a cross-section of Limburg’s garden culture and cultural landscapes. Gardens and parks create regional identity and ensure that both the local population and visitors feel contented here. Limburg is the southernmost province of the Netherlands. To the north, it is bordered by the provinces of Gelderland and Nord-Brabant, to the east by Germany and to the south by Belgium. The province was created in 1830 after it had been given to the Kingdom of the United Netherlands as an eleventh province at the Congress of Vienna. Today, Limburg comprises approximately 40 municipalities which are home to about 1,100,000 million people. Maastricht is the capital and administrative centre. Limburg’s coat of arms consists of five symbols of differing origin which are derived from the coats of arms of former principalities or areas of land. The crown of the former Duke of Limburg is positioned above the shield. Limburg is a long province, most of which is located to the east and west of the Meuse river. The landscape in the south is dominated by hills, streams and valleys while that in the north is characterised by flat sandy areas. The Meuse flows through the province from south to north. The numerous castles and manor houses are linked to the cultural landscape in a special way. Archaeological investigations have revealed that the oldest human settlements in the Netherlands were in Limburg. Agriculture used to play an important economic role in the centre and north of the province, above all on the floodlands along the Meuse. From the early 20th century onwards, the number of coal mines in the south of the province increased. This mining culture, some remnants of which can still be seen today, helped the economy of the area blossom. The mining sector later gave rise to the chemical industry, which is still located in Limburg today. Agriculture and horticulture play an important role in central and northern Limburg as does cattle breeding. Tourism has also developed into an important economic sector, with Maastricht as the central point of attraction. The south of Limburg is marked by urban development. Maastricht, Sittard-Geleen und Heerlen-Kerkrade originated from settlements which were later surrounded by fortifications and grew into cities. The urban centres in central and northern Limburg are Roermond, Weert und Venlo. The province of Limburg is mainly Catholic (the religious centre is the diocesan capital Roermond) and has two universities – in Maastricht and Heerlen – as well as several universities of applied sciences. Folk culture plays a large role in the cultural area. Shooting clubs and bands influence the culture in a particularly characteristic manner. Events such as the Open-Air Festival Pinkpop, the “Oud Limburg Schuttersfeest” and the World Music Contest in Kerkrade are known far beyond the borders of the province. Limburg province boasts a varied landscape culture which combines with the region’s architectural culture to form an exceptional ensemble. The unique nature of this cultural landscape gives Limburg its special character. The area’s cultural heritage includes manor houses, castles, churches, farmyards and village centres with protected status, which still exist in many different forms in the region. Limburg’s excellent reputation as a “green province” is also thanks to its gardens, which are often located in close proximity to the built environment. A specific type of garden design has been cultivated here over the years, which has always followed the stylistic trends characteristic of respective periods. Examples are castle gardens, monastery gardens, town gardens and farm gardens, which occur in a wide variety of historical garden styles. The Limburg landscape experienced change as a result of the industrial and technological revolution in particular, e.g. due to cultivation and the extraction of turf and coal. From the 18th century onwards, French-style gardens were created in Limburg, above all at manor houses and monasteries. The English landscape style with its open character was a reaction to this form of design. Today it is still possible to find and admire some elements of these styles. One particular characteristic of the landscape can be found in southern Limburg, where large coal mines once existed. The state mining organisation “Staatsmijnen”, which held various licenses, was also actively involved in the creation of parks and gardens in south Limburg. The thinking behind this involvement was the idea that the state as an employer had a responsibility with regard to the well-being of its workers. The “Staatsmijnen” therefore ensured that there were opportunities for recreation in the vicinity of housing developments. Many designs were created by garden architect John Bergmann, who was the “Staatsmijnen” garden designer in Limburg in the mid-20th century. Towards the end of the last century, some private gardens were developed – mostly in tree nurseries – which also served as showcases for the expertise of their designers. Some particularly noteworthy gardens resulted from these initiatives. Many different variations of garden in various styles of garden design thus exist in Limburg. Whether seen individually or in relation to each other, they contribute to the typical landscape culture of Limburg’s gardens.